Ed grew up in Tucson where he played Little League baseball. In 1973, his Cactus Little League became the first team from Tucson to make it to the Little League World Series. Even though they came in second place, the team was voted “Sports Team of the Year” in 1973. He later attended Salpointe High School where he lettered in baseball for three years and football for two years. He was all-state baseball in 1978-1979 and third team All-American in 1979. He played four years at the University of Arizona, being named to the all-Pac-10 team in 1981-1983; the U.S. All-Star team in 1981; and second-team All-American in 1983. 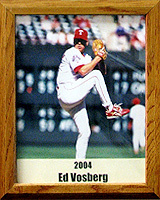 Ed played 20 years in professional baseball, including seven years in the major leagues. He played on six championship teams, including the 1983 (AA) Padres; 1986 (AAA) Padres; 1988 (AAA) Padres; 1993 (AAA) Iowa Cubs; 1997 Florida Marlins; 1998 National League champion San Diego Padres; and 2002 Mexican League Champion Mexico City Reds. Currently Ed is coaching with the Arizona Diamondbacks Rookie League team in the Northwest League. He is a proud member of the Salpointe Hall of Fame and the University of Arizona Hall of Fame. The father of two boys, Vosberg says his induction into the Pima County Sports Hall of Fame will show his children that with hard work and perseverance, your goals can be achieved.